If you are looking for a space saving, multi-functional bed, the 4You Canopy Double Bed is sure to be a perfect choice. This versatile bed features integrated shelves and a host of optional extras that further help you create your very own sanctuary. This bed is available in white and grey. Made from high quality laminated board that is easy to clean, the bed stands over 2m tall once assembled. The bed spacious, ensuring the perfect space to relax, dream and recharge. Keep reading to find out what makes the 4You Canopy Double Bed so special. Hidden shelves within the headboard offer the perfect place to store pillows, cushions, blankets and bedtime essentials. 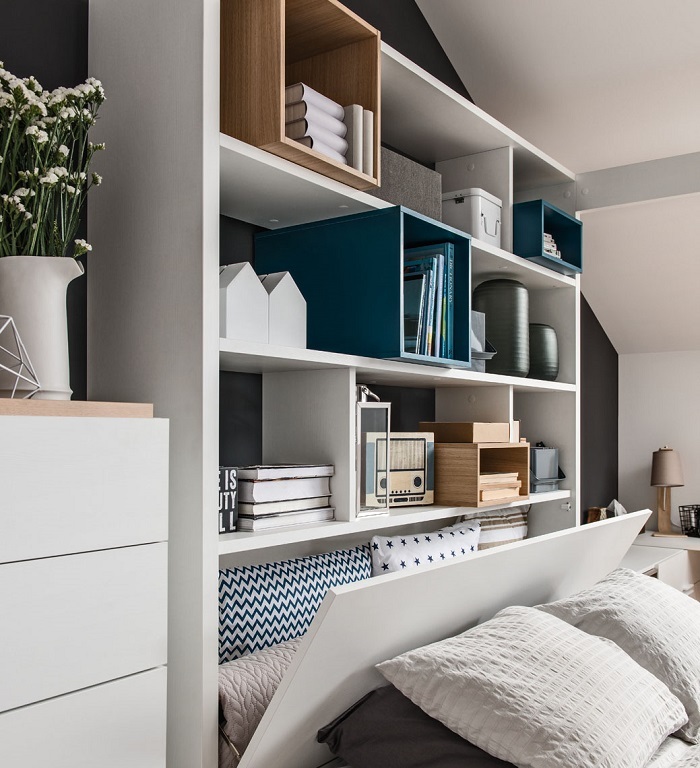 Above this hidden compartment, there are plenty of open shelves to display decor or store books and other items. Add storage cubes or the handy 4You Bed Chest to add even more space to this bed, or try a few baskets to keep your goods under wraps. This bed is ideal for studio apartments, dorms and any other room that does not have built-in cupboards or sufficient storage space. 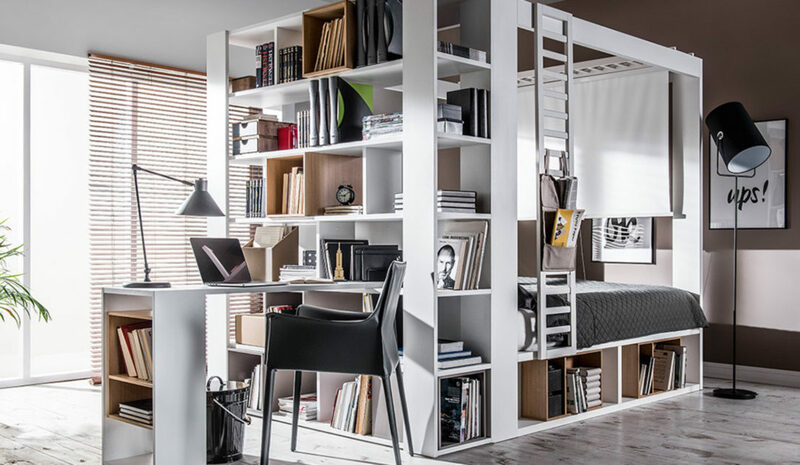 As the shelves are integrated into the unit, there is no need for additional storage. 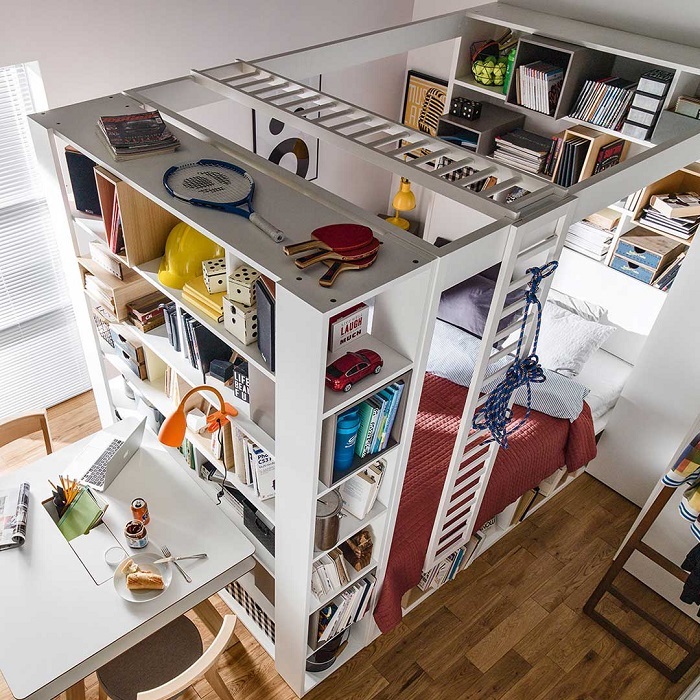 Should you need extra storage, however, it can be easily added to the bed. Two sided bookcases can be placed along the back and furniture such as the 4You dressing table/desk can be added to add even more storage. The bed also has small shelves along its base to keep books, blankets and other items out of the way. This bed is extremely versatile, with almost unlimited options in looks, storage and functionality. 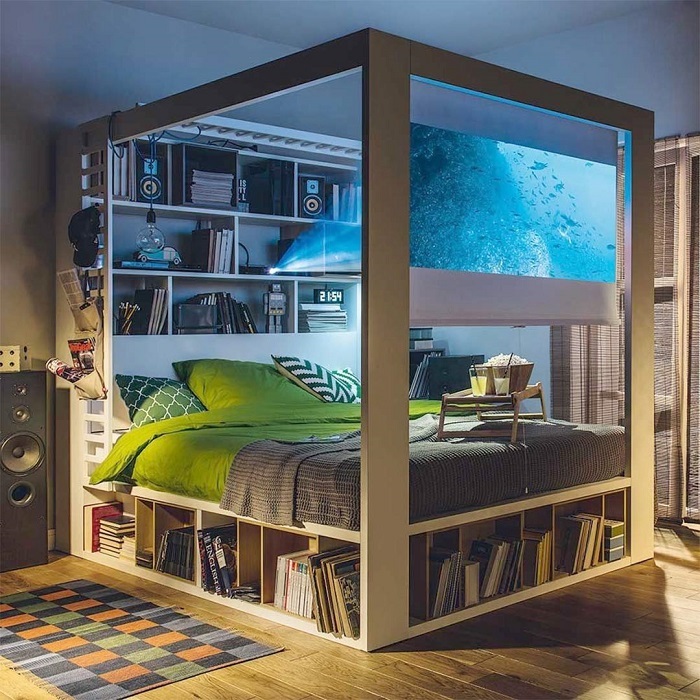 The canopy can easily fit a screen, transforming your bed into your very own private cinema when a projector is added. Side and top ladders are available as optional extras, allowing you to design your bed according to your preferences. Plants, bunting, garlands and other decor items can be hung from the canopy, while additional shelves and dressers can be added as needed to further maximise your space. Visit VOX to find the 4You Canopy Double Bed and a wide range of accessories that further help you create your dream space.